Who's heard our tracks Sunday Maybe and Lullaby Horizon (Sunday Maybe Mix) on Spotify's 'microtherapy' playlist? If you haven't, you should definitely click here to check it out. We're happy to announce that Tripswitch will be joining us as our special guest for our show at Hangar, London next week. Limited tickets are available here. Our new EP ‘Sunday Maybe’ - comprised of five chill-out mixes of tracks from our last album, ‘Tuesday Maybe’ - will be available to stream/download on April 20th. The EP will also be released as part of a special three-disc vinyl set, including both ‘Sunday Maybe’ and ‘Tuesday Maybe’ in its entirety. Each copy has been hand-signed by Nick Warren and Jody Wisternoff, and will also be released on April 20th. You can pre-order the vinyl and hear ’Sunday Maybe’ now from here. Have you checked out our online store yet? It's the only place where you can find our new Tuesday Maybe tour t-shirts (as well as rare CDs and vinyl from our back catalogue). We're down to our final stock, so you'd better move fast... Get yours from http://wayoutwestmusic.bigcartel.com/. We're pleased to announce that our show at Hangar, London has been rescheduled for Wednesday 18th April. All original tickets will be valid for the rescheduled date. A limited number of additional tickets are available here. 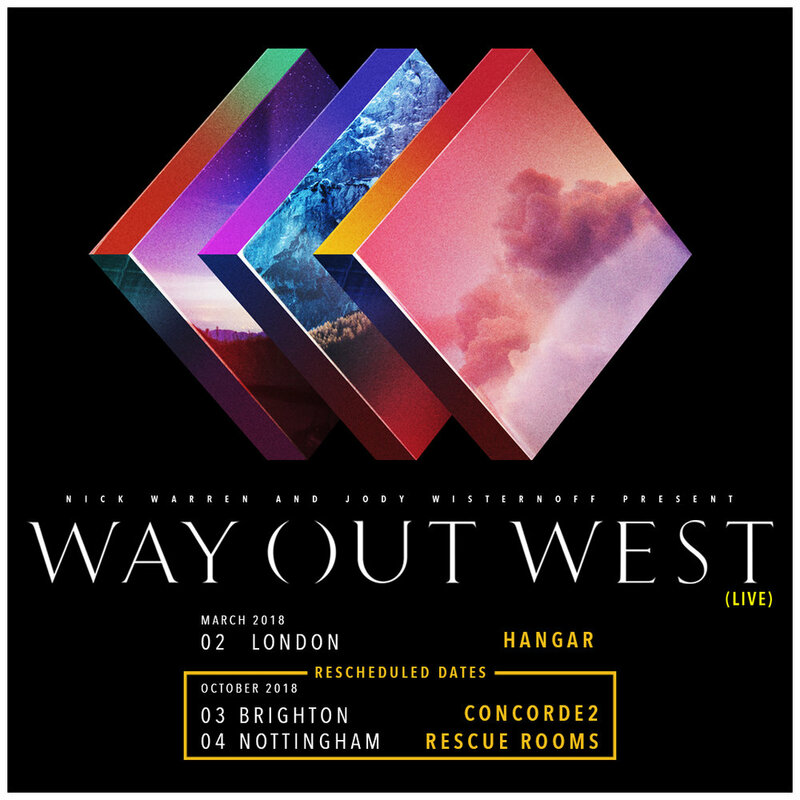 Due to the adverse weather conditions, Way Out West have been forced to postpone tonight's show at Hangar, London. We're working with the promoters and venue to re-schedule the show. In the meantime, please keep hold of your tickets - they’ll be valid for the re-scheduled date. 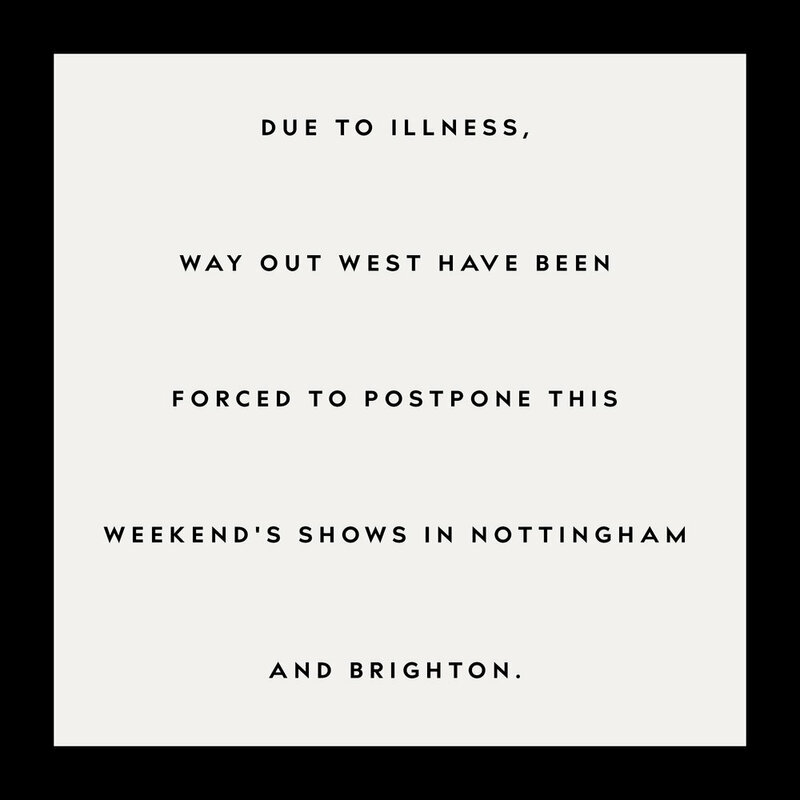 Due to illness, Way Out West have been forced to postpone this weekend's shows in Nottingham and Brighton. We're working with the promoters and venues now to re-schedule the dates. In the meantime, please keep hold of your tickets - they’ll be valid for the re-scheduled dates. Our brand new online store is now up and running! Click here to head to our store and check out our new Tuesday Maybe tour t-shirt, as well as some special CD and vinyl copies of releases from across our back catalogue. Way Out West - Tuesday Maybe (Remixed): out now on Anjunadeep. Featuring brand new remixes from Ben Bohmer, Phaeleh, and many more. Click here to get your tickets from See Tickets. Listen to our new single 'The Call' featuring Doe Paoro now! Very excited to finally reveal our new album! We're excited to be playing the Anjunadeep Xmas event at XOYO on 23rd December! Grab your tickets here. We're excited to be hitting the high seas onboard the World’s Largest Floating Dance Music Festival, THE GROOVE CRUISE, this January in Miami! Don’t miss the boat! Our new single 'Set My Mind' is out now! Download / stream from the following sites. Lots more to share very soon! We are super excited to go back to New York for Electric Zoo Festival! This is going to be a great one, see you there! Showing some West Coast Love… We’re back in LA playing live at Sound Nightclub on June 27th! Excited to announce we'll be returning for more live dates in the US & Canada in June and July! We are excited to announce our first gig back to the UK will take place on May 6th at Wax Format 4th Birthday Bash.